Born in Hull in 1934, Shirley Craven studied art at Hull College of Art and then printed textiles at the Royal College of Art, 1955-58. In 1959, aged 25, she started work at Hull Traders, a textiles firm founded two years earlier in Willesden, London, by entrepreneur Tristam Hull, who had ‘ambitious artistic aspirations’, (Jackson, 2007, p.104). 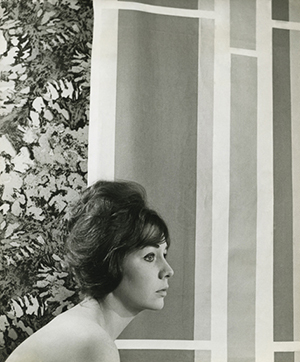 In 1963, she became Chief Designer and a Director of the firm, where she worked for nearly two decades. In 1960 Design magazine described the company as having a ‘high reputation for producing adventurous and exciting designs’, which they attributed to the tight control of Craven, who displayed a ‘dramatic and original handling of colour and pattern’ (Design, 1960, p.185) During this time Althea McNish and sculptor Eduardo Paolozzi also produced designs for Hull Traders. 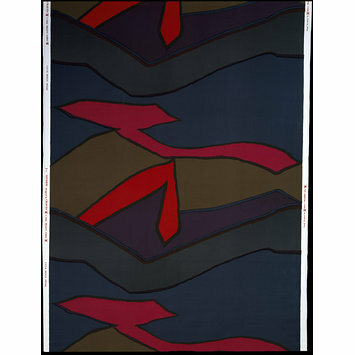 According to the Textile Society, Craven ‘pioneered an aesthetic more akin to painting than textiles’, breaking ‘all the rules’ and ‘revolutionising post-war furnishings with her dramatic, unconventional large-scale designs’. Her bold patterns and colours were commercially successful, capturing the style of the swinging sixties and received critical acclaim. She won the Design Centre awards three times: 1960, for ‘Le Bosquet’; 1964, for ‘Shape’, ‘Division’ and ‘Sixty-Three’; and 1968 for ‘Five’ and ‘Simple Solar’ Craven was a member of the Society of Industrial Artists and Designers (now CSD) and married to the designer Bernard Holdoway, (1934-2009). Lesley Jackson, Shirley Craven and Hull Traders, 2009. Jackson also curated an exhibition entitled, Shirley Craven and Hull Traders at the Ferens Gallery, Hull, in 2009-2010.